Currently, I am a member of the National Ballet Orchestra (Toronto), Music in Common and the Stratford Festival Orchestra. 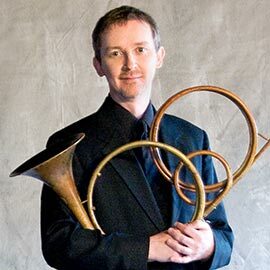 I am a frequent recitalist and lecturer on historical horn and have performed on more than 30 recordings with Tafelmusik, Arradia, American Bach Soloists (San Francisco) and Apollo’s Fire (Cleveland). During my 30 seasons as a member of Tafelmusik, I appeared as a soloist at the Mostly Mozart Festival at New York’s Lincoln Center and at Orchestra Hall in Chicago. I believe very much in nurturing the complete musician. A French horn player has to be an artist, athlete, historian, composer, teacher and thinker.